New South Quarter is a £160 m contemporary urban village on the Purley Way, one mile from Croydon town centre and within easy travelling distance of London. CCL is supplying CCL’s new XU and XF systems and supervising their installation in the first two residential blocks to be constructed. The new CCL post-tensioning system is designed to meet European standards for post-tensioning materials and testing. Barratt awarded the first phase of this development to Lancsville construction who commissioned CCL to undertake the post-tensioning after being impressed by CCL’s competitive price, enthusiastic approach and track record of delivering outstanding solutions. 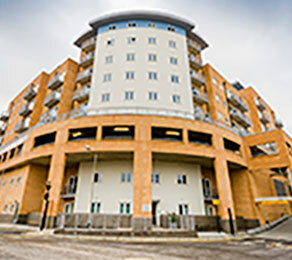 CCL used bonded multistrand post-tensioning on the first-floor transfer beams, and unbonded post-tensioning has been used at all floors from level one through to six of the new residential areas. Nearly 200 tonnes of high-tensile-strength cable were installed in total, including approximately 19,000 anchors and wedges. The design objective for the development was to achieve a flat soffit and minimal floor thickness. The use of a bonded multistrand system allowed the thinning down of transfer beams, whilst unbonded post-tensioned slabs allowed the structures to maintain a minimal slab thickness throughout. The project had very tight timescales and CCL were chosen due to their ability to react quickly in order to mobilise and execute works on both the bonded multistrand transfer beams and unbonded flat-slabs.